I love baths; so when I saw this Anatomicals Relaxing Bath Kit in Target, I knew I had to try it out. I've tried a few of their other products and have been pretty happy with them, so why not. Plus, this was 30% off! This gorgeous pack contained four products; the Strawberry Bubble Bath, the Cherry Bottle Lotion, an inflatable bath pillow and a cute rubber ducky! 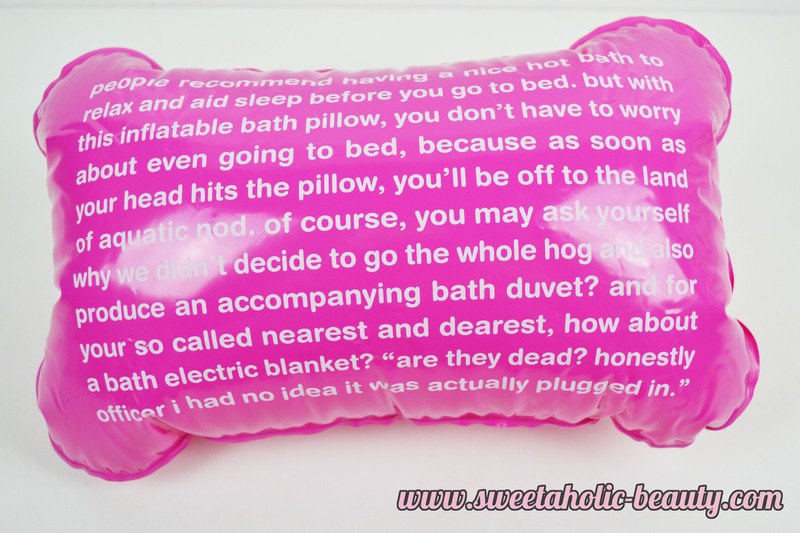 The inflatable bath pillow is a really great addition. I've wanted to buy a bath pillow for a while so this was very welcome. The description is a bit wild, though! I have to say I was really surprised by this bubble bath. I was a bit skeptical when I sniffed it, it had a very strong scent. Nonetheless I popped some in the bath to give it a go, and I was impressed at how bubbly it got. I felt like I didn't have to use a lot either, so the bottle will probably last me a while. In terms of the scent, I was delighted to find that it was not as strong as it seemed, and was actually very subtle. This smelt amazing! Every now and then I find an Anatomicals product that smells exactly like a Chuppa Chup. This one smells exactly like the cherry Chuppa Chup, which is truly delicious. Aside from the scent, the actual lotion itself absorbs very well and doesn't leave my skin feeling greasy. Overall, I was pretty happy with this kit. I love the bubble bath and the body lotion, and would definitely repurchase them separately. This kit makes a great gift as well! Have you tried these products from Anatomicals? If so, what are your thoughts? Anatomicals is such a cute brand haha! I haven't managed to try anything from them yet, but this set looks like a great way to! I don't think I've seen that particular set before! Jealous! I need to track it down! I would love to smell like a chupa chup. I love that bath pillow it's so cute! Amazing set <3 I'm a new follower and cant wait to see more beauty posts!